Martin Luther King Jr. Elementary School: Latest News - MLK Students and Staff Entertain! MLK Students and Staff Entertain! Friday, May 12th, students entertained a large audience with a variety of talents. Participants included Sharon Berry, Thadius Toliver, Antwoine Poindexter, Genesis McGee, ShaNiyah Watkins, Toby Haby, and Hayden Merrick. As judges tabulated scores, a swimmy group of MLK teachers encouraged students and staff alike to stay active over the upcoming summer break. Click this link to be inspired. Sharon Berry placed third overall. Toby Haby and Hayden Merrick took second place. 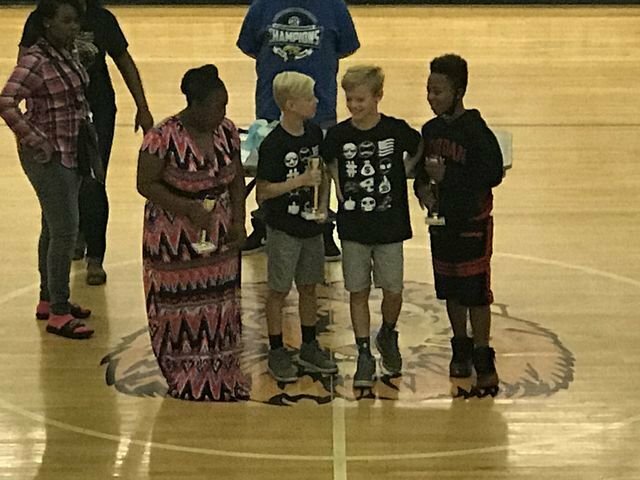 Antwoine Poindexter recieved first place for his talents.